The large-sized plate of rock is the sky. 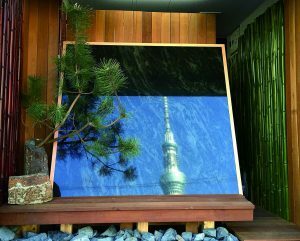 Reflected on the plate is the Sky Tree, surrounded by clouds carried on an ascending current of air. The overall image will display a view of the Sky Tree standing tall with a single branch in the foreground. © 2019. 坪庭 スモールガーデン All Rights Reserved.